DIY - Board Game Tournament fundraiser! Scrabble is all about being fluent in the language and coming up with words that might be worth a lot of points. People have fun coming up with strange and exotic words no one else has thought of. Teams of four, six, or eight gather at different tables, each with a Scrabble board and all the letters available. Each team starts with the same opening word, and has 20 minutes to fill the board with high-scoring words. A judge sits at each table. Individuals pay $35 to participate. Players can sneak a peek at a dictionary for an additional $10 donation. Make extra fundraising money selling refreshments, raffle, auction, etc. Additional details and ideas available from the National Scrabble Association. 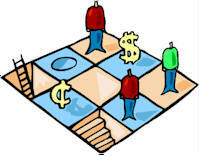 Monopoly Tournament: Design your MONOPOLY® fundraising tournament to “fit” your organization and potential supporters. Most organization charge an admission fee for individuals and/or teams. Don’t forget the possibility of business supporters who can sponsor specific spaces on the board. Most fundraising tournaments are conducted on a set time limit basis. If you want to really do it right, contact the National MONOPOLY® Tournament Director at Hasbro. MONOPOLY® Trivia: The longest MONOPOLY® game ever played was 1,680 hours – that’s 70 straight days; longest game in a bathtub – 99 hours; longest game underwater – 45 days; and longest game played upside-d/own – 36 hours. The largest outdoor game ever played used a game board 938 feet wide by 765 feet long. The game required approximately a full city block! The largest indoor game ever played used a game board 122 feet by 122 feet in size. Parker Brothers prints about 50 billion dollars worth of MONOPOLY® money in one year. The total MONOPOLY® money in a standard set is $15,140. Values on the MONOPOLY® game board are the same today as they were in 1935! The most extravagant MONOPOLY® board game set ever produced was the centerpiece of the 1988 MONOPOLY® World Championship held in London. Made with diamonds, rubies and eighteen carat gold, the set was valued at over $1,000,000! Really Feeling Brave? Consider an underwater MONOPOLY® fundraising tournament. While most players are content playing the MONOPOLY® game on a card table or their living room floor, others choose more exotic locales for their games. The MONOPOLY® game has gone to sea countless times. In 1964, Parker Brothers built a special set for New England Divers, Inc. to use underwater. The special steel-backed board was laminated with cellophane and weighed 95 pounds. In 1983, the Buffalo Dive Club played for 1,080 hours — underwater. Some 350 divers took turns to keep play going for 45 consecutive days. At a cost of $1,300, Parker Brothers made a special MONOPOLY® board game set for underwater marathons. The set disintegrated after a 1,080 hour event sponsored by the Buffalo Dive Club in upstate New York.